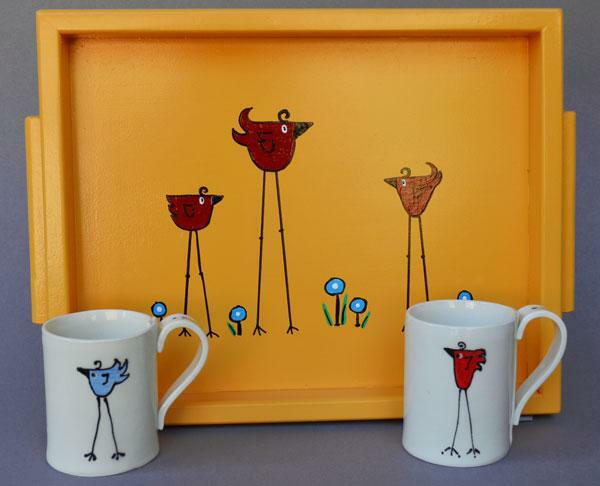 “STEP-UP to HELP OUT” is Ashland Art Work’s annual Fall Fundraising Event. Local artists and students have uniquely painted 35 (?) hand-crafted wooden serving trays and stools. Donations from the sale of the art pieces will benefit two local charities: Maslow Project for Homeless Youth and the Jackson County Humane Society. The gallery is requesting a minimum donation of $50 per tray or stool. “CLAY CREATURES” will feature whimsical clay animals hand-built by Marydee Bombick. 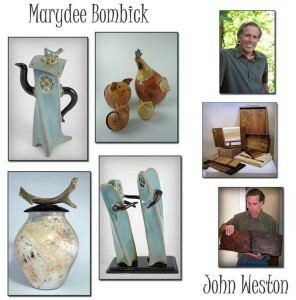 “WONDERFUL WOOD” will highlight the fine woodworking of John Weston. Benches, letter boxes, coat racks, bowls, and cutting boards are all crafted from sustainable local and exotic woods. “I am a senior at Ashland High school, and I plan on graduating this January of 2013. All graduating seniors are required to complete a senior project. I decided to take this as an opportunity to focus my project on something that has always been a passion of mine; painting. Ever since I discovered my enthusiasm for art, I greatly enjoyed sharing my creations with others. Naturally, when someone suggested to me to do a gallery show, the idea stuck. “For the past four months I have been beefing up some of my already existing works of art, as well as working on a few new pieces. A commonality of all my paintings share is that the image being portrayed is only in black and white, or black ink. Recently, black India Ink has become my favorite medium to work with. It leaves the finished product looking sharp as well as eye catching. “For me, art is the representation of the human experience. An outlet for all emotion and thought. It is something that calms me, making me feel at peace. It has become my own form of meditation.